Regardless of the nature of the business, every organization is seeking a robust customer experience management (CEM) system to explore new ways to serve both existing and prospective customers. The need for such a system is heightened by the far-reaching integration of the consumer experience across physical and virtual environments. By leveraging technologies such as AI, big data, and IoT, organizations are able to use digital channels to execute marketing promotions, increase market share, stimulate sales, attract new customers, and serve existing customers like never before. The increased interaction between businesses and its customers has given birth to customer experience (CX) metrics—that organizations effectively utilize to execute data analytics for driving revenue. This is precisely why all parts of an organization and ecosystem must be aligned with the optimization of the customer experience, since CX is truly a driver of revenue for organizations that are ahead of the curve. As more organizations realize the importance of CX metrics and insights formulated by data acquisition, they need a reliable CEM Solution Provider to help chalk out a data-driven CX strategy to drive sales and optimize the customer journey. It’s obviously no easy feat to deliver personalized and consistent customer experiences—at scale—especially for smaller or midsize organizations that don’t have the requisite resources or personnel. Helping your business choose the ideal CEM solution provider can be an arduous task. 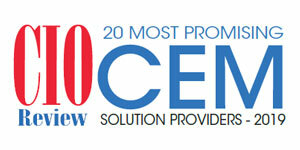 To help shortlist the options, the editorial team at CIOReview, along with a distinguished panel of CEOs, CIOs, Vcs, and industry analysts, have complied the twenty most promising CEM solution providers in the industry.